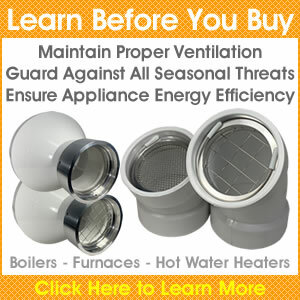 How to determine the size and type of vent screen or cap is a question many of our customers have asked in the past. Our goal is to empower you, our valued customer, with the information you need to make an informed and accurate purchasing decision. The last thing we want is for you to get the incorrect vent screen size because this is something that can be easily avoided with just a tape measure and a few minutes of time. In the video below, we demonstrate not only how to measure your PVC vent terminations, but also how to identify its size by the numbers embossed on the hub by the manufacturer. Though the first part of the video dives right into dimensional data, the remainder of the video touches on seasonal use considerations and how to install and remove our vent screens. Please note our PVS series vent screens are designed to fit inside a PVC hub or coupling. 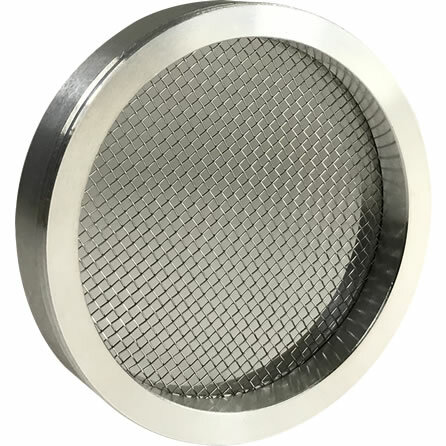 In the HVAC, plumbing and pest control industries our PVS series vent screens are known as inserts. What this means is that outside diameter measurements of vent terminations will not determine appropriate fitment. For example, in our store we sell 4” PVC vent screens that insert into 4” PVC hubs and couplings. What many people do not know is that the inside diameter of a 4” hub or coupling is actually 4.500”. On rare occasion, a customer may incorrectly measure the outside diameter of a 3” PVC hub, which is 4”, and purchase a 4” screen that will not fit. Knowing this, it is important for you to measure the inside of your PVC hub or coupling since it is the critical dimension needed to determine what size PVS series vent screen you will need for your high efficiency furnace, boiler, hot water heater or other application. In the picture above you will see a 2” PVS-IS2 vent screen installed inside a standard 2” PVC hub, which measures 2-3/8” on the inside. 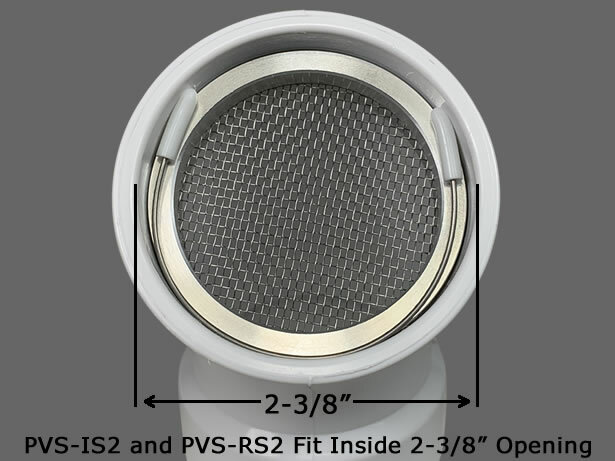 If your hub or coupling has an inside diameter (open area) of 2-3/8”, then please select a 2” PVS-IS2 or PVS-RS2 vent screen for your two inch vent(s). In the picture above, you will see a 3” PVS-RS3 installed inside a standard 3” PVC hub, which measures 3-1/2” on the inside. 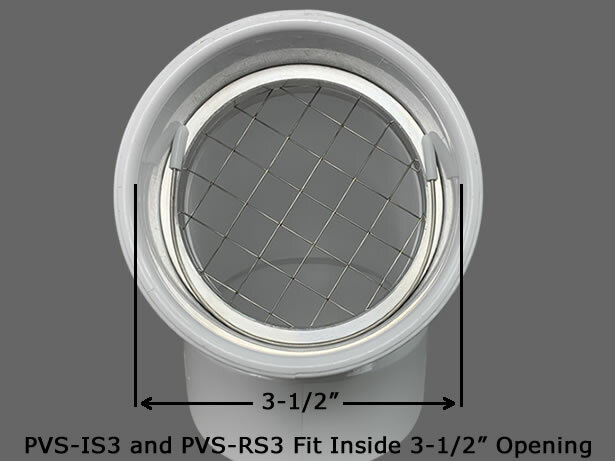 If your hub or coupling has an inside diameter dimension of 3-1/2” (open area), then please select a 3” PVS-IS3 or PVS-RS3 3” vent screen for your three inch vent(s). In the picture above you will see a 4” PVS-IS4 vent screen installed inside a standard 4” PVC hub, which measures 4-1/2” on the inside. 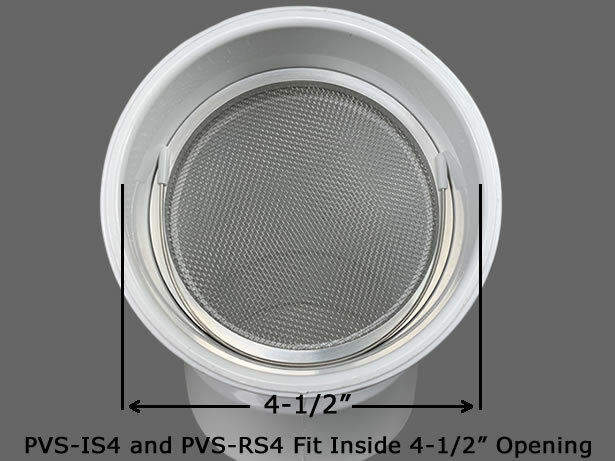 If your hub or coupling has an inside diameter (open area) of 4-1/2”, then please select a 4” PVS-IS4 or PVS-RS4 4” vent screen for your four inch vent(s). It is important to note that 4” PVC vent terminations are rarely used in residential applications, with the exception of larger homes. 4” PVC vent are most often used for commercial and government venting applications. It is important to note that PVC pipe is measured by its inside diameter. Two inch PVC pipe measures 2.067 on the ID, three inch PVC pipe measures 3.068” on the ID and four inch PVC pipe measures 4.026” on the ID. But wait, you just contradicted yourself when you told me what size screens will fit! Not really. PVC hubs and couplings are made to join like pipe together. For this to happen, hubs and couplings must be larger to accept the outside diameter of the pipe being used. Therefore, our 2” PVC vent screens are designed for ventilation systems using 2” PVC hubs and couplings. Our same consistent vent screen sizing reference applies to 3” and 4” ventilation systems. If the inside diameter of your vent termination(s) do not match what we have pictured above, one of two things may be happening. First, and least likely, is that your vents do not terminate with a standard size PVC hub or coupling. It’s more likely that your vent terminations do not have a hub or coupling on the end and you have straight pipe coming out of the building. Vents that come straight out of a home are definitely not desired. In addition to insects and animals easily gaining entry into the vents, straight vent pipes are also more susceptible to horizontal rain and furnace lockouts due to wind. If you have straight pipes coming out of your home, refer to the paragraph above for dimensions to confirm what size pipe you have. Once the size has been determined, you have the option of adding an equivalent sized elbow hub yourself. PVC elbows with hub x hub connections (both ends) can be purchased from Home Depot, Lowes, Menards and local hardware stores for less than $2 each. In such cases we recommend 45° elbow hubs or less with the exhaust pointed down and slightly away from any intake hub that is pointed straight down. There are also adapter fittings available, which allow pipes to transition from one size to another. If an adapter is used, always adapt to a larger size so no restrictions are created from adding an under-sized vent termination from the reducer. Regardless if an elbow hub or adapter is used, when installed outside the premises it does not need to be cemented on permanently. A slip fit is sufficient when a hub has been added to an existing and fully functional unmodified vent termination. Some HVAC techs choose to use silicone to fill the small void where elbow hubs and pipes mate, which is acceptable as well. While we are on the subject of size selection, we don’t want to overlook the proper use of our vent screens as it is closely related to all purchasing decisions. In most cases our PVS-IS series vent screens can be used all year long by those residing in regions where temperatures do not fall below freezing. Those that experience cold weather should use our PVS-IS series insect and rodent PVC vent screens during spring, summer and early fall when temperatures are above freezing. When the temperatures drop near the freezing point, at a time when insects are no longer active outside, we highly recommend installing our PVS-RS series rodent vent screens for the winter season. Fine mesh screens can and do frost or ice over, further diminishing their ability to allow air and exhaust gas to pass through. Our PVS-RS series vent screens are designed for maximum airflow when you need it most, which at 90% greatly exceeds other competing rodent screen models that are known to be highly restrictive in colder temperatures, which can lead to unwanted furnace lockouts and the unsafe buildup of carbon monoxide within homes and commercial dwellings. Since we protect our families home’s exterior PVC vents with the same vent screens we sell, it would be a disservice to you if we did not warn you about inferior products being sold. 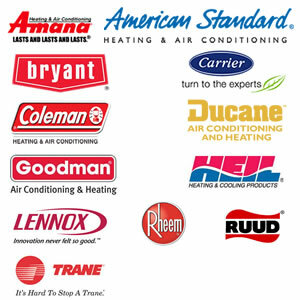 If you are still shopping for a vent screen product, always ask yourself why some sellers don’t advertise how much air their vent screens allow through. In many cases, other rodent screens on the market limit airflow to 60% or less (even less than our PVS-IS series dual insect and rodent screen models) which can be confirmed by a professional combustion analysis (measures elevated levels of carbon monoxide and inadequate oxygen for flame burn). Keep in mind that during winter, those 60% airflow models may collect frost and possibly ice over; creating an even greater and potentially unsafe restriction. 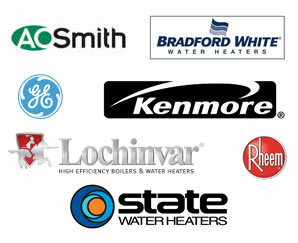 It’s our hope that the information on this page will help you make an informed and confident purchasing decision. Though we made every effort to explain vent screen and cap sizing in detail, as it relates to our PVS series vent screens, please visit our FAQ page if you have additional questions or visit our compatibility page for more visual assistance in determining the size of your ventilation system. If needed, please do not hesitate to contact us for personal assistance.